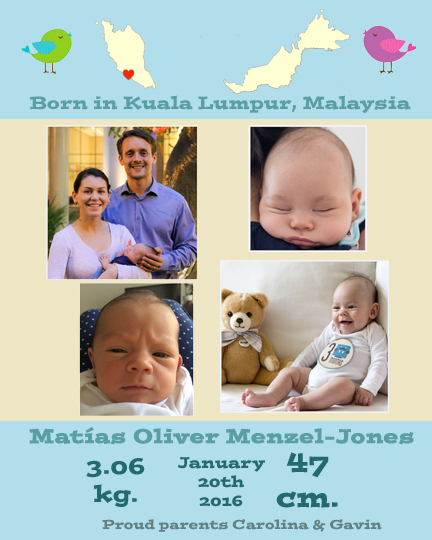 It only took us five and a half months to have Matias' birth announcement designed, printed and mailed. But you know how it goes, better late than never. So we are late for the announcement, and for sending out all our 'thank you' notes to everyone who showered Matias with the most beautiful gifts he could ever imagine, but the intention and the gratefulness is still there. My family and I are so very grateful for everyone who visited Matias, and for all of those who sent him adorable gifts from around the globe. Some of the gifts are now too small for him, like onesies and socks. Others, he either needs to keep growing or needs to visit a cold place. Matias is now almost six months old. He is recognizing his name when I call him. He is turning over from his back to his belly every time we leave him on his back. We now have to be very careful when we leave him on beds, or sofas as he will turn himself over in an instant. In less than a week, we will be living in a new apartment. It is kind of sad to be leaving our current apartment, since a lot of big events happened when we were living in it: Marriage proposal, Matias' birth, wedding day, and so many other memories. I will definitely miss the good things about this place (and not so much the bad things). Soon, off to make new memories in our next home!